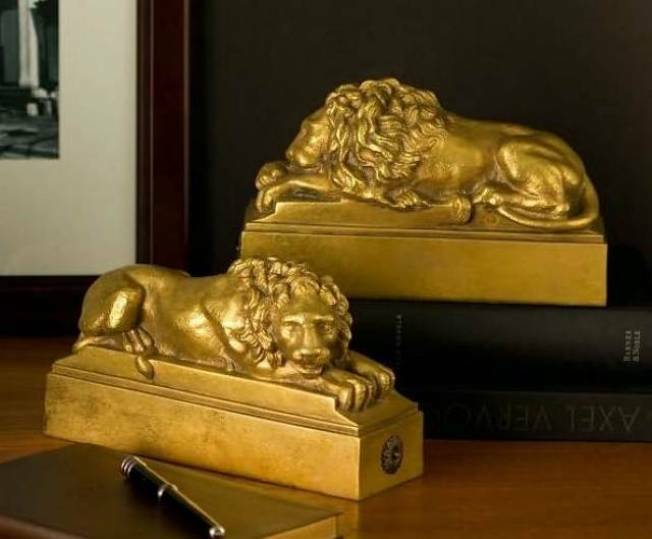 HEAR ME ROAR: Keep book collections stored safely between these Gilded Resting Lion Bookends; they’re modeled after those iconic lions that guard the entrance to the New York Public Library, perfect for the true book worm. Available at Barnes and Noble. SQUAWKY ACCESSORY: Waddle to Bloomingdales to scoop up these Penguin Salt & Pepper Shakers by Jonathan Adler; a playful set of high-fired stoneware that tune us in to nature (and the season!) without a trip to the zoo. Get them at Bloomingdales. MUST-HAVE BAUBLES: Take 40 percent off earrings, necklaces and other styles over $100 now through Tuesday December 1 at Jess LC. Plus, we hear she has a new Soc Chic necklace that’s been getting some attention. See her collection here. GOLDEN TRIANGLE: There’s never a short supply of odds and ends for the home at The Golden Triangle; and with the holiday market happening, features silk scarves, pillow covers, jewelry, and more between $10 and $1,000, you can score items like this Neolithic Pottery Tripod Jar with Handle for less. Now through December 31st.